Through experience, we have built a philosophy that encourages connection within your financial life. Our wealth planning services are designed to capitalize on the natural bridge between your investments, estate and protection plans. This is your legacy. It is designed to help increase your net worth, protect your assets and provide the tools to reach your goals throughout varying economies and stages of life. Your estate encompasses a wide range of information and assets, from investment records to estate planning documents to the intangibles of your legacy. Documenting and communicating this information is crucial in helping your heirs and beneficiaries locate and account for all of your assets. Millions of dollars go unclaimed from banks and insurance companies each year, or are frozen in court proceedings. Getting and staying organized now can help you and your heirs avoid such issues. 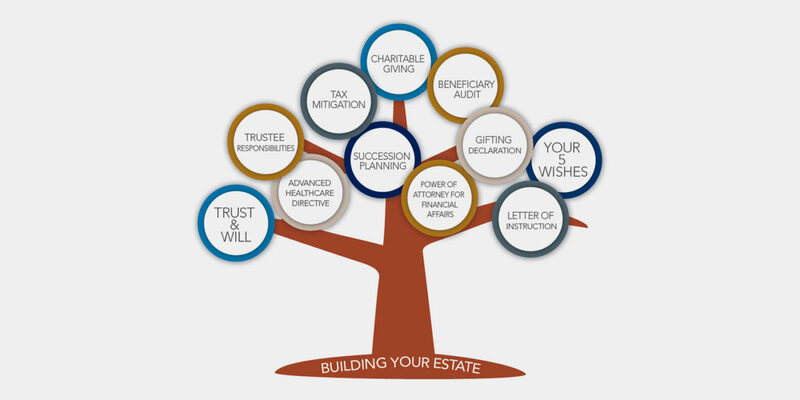 While trusts are considered to be the foundation of an estate plan, there are many other documents that convey your wishes and provide a road map for your beneficiaries. This tool logs the location of important documents such as your trust, will, birth certificates, deeds, employment records, insurance policies, financial and investment accounts, and other legacy items. For you and your family members, including Social Security Numbers. Provides details as to how you would like your caregivers to proceed in the event of your death or incapacitation. Such as Attorneys, Accountants, Financial Advisors, Insurance Agents, Physicians. Our 5 Levels of Asset Protection are designed to help protect you from jeopardizing your standards of living or compromising your financial freedom. The protection strategies on which we focus are designed to help you overcome and triumph over volatile economic conditions and changing tax legislation, as well as improper planning, risks, healthcare dynamics, legacy planning, disability, death, and aging parents. Your legacy is more than simple material belongings for your heirs. It’s your life. It’s what you stood for, what you have learned, your memories that you wish to convey to your friends and loved ones, your values and core belief system, as well as your financial interests and bequests. It is commonplace for people to focus on the latter, “What do I give?” or “What do I get?” Legacy planning can be far more involved and meaningful. So, to maximize your legacy; begin now, not after death. KS&A’s legacy planning component provides you with the tools to create your living legacy structure in order for you to pass on your priceless, unmatched gift, your thumbprint on this world. We can help you weigh different strategies to determine the best methods for transferring your wealth. From charitable accounts to Roth IRAs, prototype trusts and other advanced strategies, there is an overwhelming amount of information out there. We eagerly await the opportunity to share our experience and help you find the solutions that make the most sense for your situation.